RFK offers insights into topics in American history including the presidency, political families and campaigns, the tumult of the late 1960s and especially the shock year 1968, political assassinations, leadership, race relations, civil rights, regional political differences, the Cold War and containing Communism in Eastern Europe, Cuba, and Vietnam, Congressional investigations, the farm workers' movement, and more. Use the film or this Web site to learn more, either in a classroom or on your own. The following activities are grouped into 4 categories: civics, history, economics, and geography. You can also read a few helpful hints for completing the activities. 1. Read Robert Kennedy's Kansas State University speech, in which he criticized the Johnson Administration零 handling of the Vietnam War. As you read, make two lists: (a) the things Kennedy says have gone wrong in South Vietnam, and (b) the steps he recommends the United States take in response. When you are done, write a news story of about 500 words about the speech, as though you were covering the event for your local newspaper. The story should summarize Kennedy零 most important arguments and recommendations and include at least two brief quotations from the speech. You also should describe the atmosphere of the speech as described by witnesses in the film. Then write a 500-word commentary on the speech. Your commentary can reflect your own personal position, but it does not have to. Have volunteers read one of their pieces to the class and ask the class whether it was effective as a news story or commentary. 2. 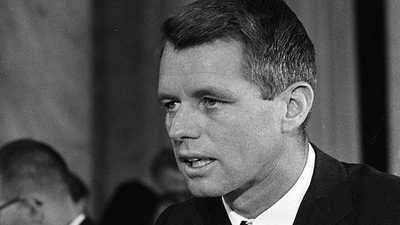 Read What if?, historians and colleagues' comments about what might have happened if Robert Kennedy had lived. Then hold a class debate on the following question: If Kennedy had been elected president in 1968, would he have dramatically changed the course of American history? Begin by selecting the topics that the debate will cover, such as American involvement in Vietnam, honesty in government (the Nixon Administration's Watergate scandal), the economy and opportunities for the poor, and relations among the races. Divide the class in half at random, with one group arguing that Kennedy would have made improvements in these areas, and the other arguing that he would have failed. Use information from the film, the Web site, and your own research to support your statements. 1. Imagine that it is shortly after the Kennedy administration took office in 1961, and you have been asked to brief President Kennedy and Attorney General Robert Kennedy on the issue of whether the Administration should make civil rights for African Americans one of its top priorities. Divide the class into three groups. The first group should prepare and then give a brief (five to ten minutes) presentation that describes the unequal treatment African Americans receive in the South and argues for federal efforts to enforce existing civil rights laws and enact new ones. The second group should prepare and then give a brief presentation that describes the importance of the South to the Democratic Party and warns that stressing civil rights could damage the President's chances of getting other initiatives through Congress — and winning re-election. The third group should act as the president and attorney general. After the presentations, each member of this group should give his or her opinion on what the administration should do. 2. Divide the class into two groups; assign one group the election of 1968 and the other the election of 2004. Have each group prepare a poster-sized timeline of the major events of the election campaign it was assigned, starting when the first major candidate announced his candidacy for his party's presidential nomination and ending on election day. Now post the two timelines side by side and compare them. Answer the following questions as a class: (a) How long was each campaign season? (b) In which campaign do you think primaries were more important, and why? (c) In 2004, could a candidate have announced his candidacy as late as Kennedy did in 1968 and still have a realistic chance of gaining the nomination? Why or why not? (d) What advantages and disadvantages do you see in a shorter (or longer) campaign? 1. Especially in the early part of his public career, Kennedy was a fierce opponent of communism at home and abroad. 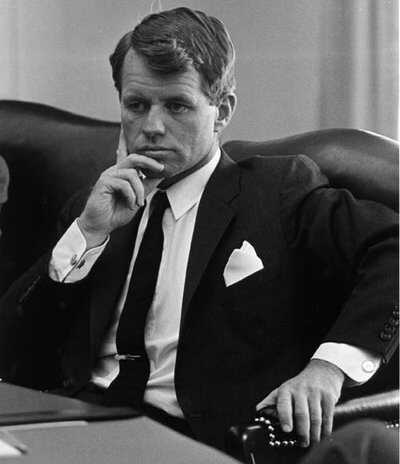 Read RFK's speech on freedom vs communism, the feature on RFK's enemies, and Operation Mongoose. Now divide the class into four groups and assign each group one of the following countries: Cuba, South Vietnam, West Germany (West Berlin), and the United States. Each group should prepare a five-minute oral presentation on the challenge that communism posed to that country, the American response during Kennedy's years in public life, and the long-term effect of communism on that country. Try to include at least one visual in your presentation. 2. As a class, prepare an illustrated world map entitled "1968: A World in Turmoil" to accompany the interactive calendar feature, Shock Year: 1968. On the map, place entries from the calendar that give examples of unrest in various countries around the world; include the date of the event and a very brief description of what happened. Find photos to illustrate as many of the entries as possible. 1. Read profiles of Jimmy Hoffa and Cesar Chavez. In the late 1950s, Kennedy engaged in bitter public disputes with Teamsters union head Jimmy Hoffa, while in the last few years of his life, Kennedy was a strong supporter of Cesar Chavez's union activities with farmworkers. Imagine that you are a newspaper reporter interviewing Kennedy during his run for the Democratic presidential nomination in 1968. Your assignment is to find out Kennedy's views on unions. Write a series of questions you would ask Kennedy, as well as the answers you think he might give. When you are finished, compare your interview with those of your classmates. 2. As the film states, Kennedy believed that efforts to rebuild poor communities like Bedford Stuyvesant would succeed only if residents played a leading role rather than relying completely on government help. First, discuss as a class the kinds of specific problems that poor communities tend to face, and the hurdles that can prevent these communities from prospering. Then break into small groups and discuss the following questions: What sorts of steps might residents take to improve their community? What sorts of outside organizations, besides government, might they try to recruit as allies in their campaign? After each group has brainstormed a list of suggestions, share them with the class. It's one of the tantalizing questions in American history: what if Robert Kennedy had not been assassinated? 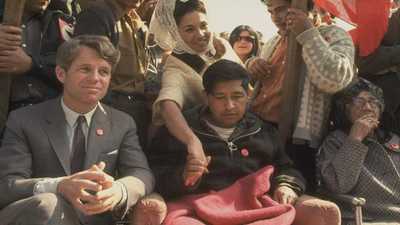 RFK was so impressed with Chavez, that all doubts about getting involved with the farmworkers were erased. 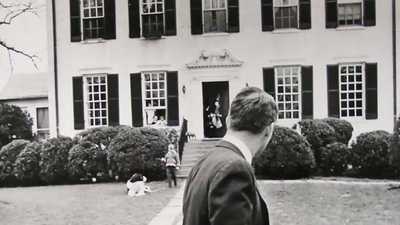 The true center of the Kennedy political dynasty in the '50s and '60s was Hickory Hill, the Virginia home of Robert and Ethel Kennedy.